I try not to set any expectations when it comes to Mother’s Day. Yes, it’s a holiday that recognizes the hard work, effort and love that knows no bounds of a mother, but it is hardly a holiday from mothering. But I’ve got to hand it to my husband–today was a great day. It started with a “sleep in” until 7:40. Yes, believe it or not, that is sleeping in around these parts. 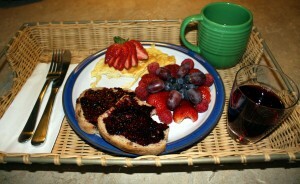 I was woken by a soft kiss on the cheek from my 5-year-old and a beautiful tray full of yummy breakfast; a perfectly cooked 2-egg omelet with a fanned strawberry atop, two slices of cinnamon raisin toast with blueberry jam, fresh mixed berries, a mug of tea and some juice. The presentation was impeccable, as evidenced in the picture below. Then came the gifts. Both my boys had made me gifts at daycare. 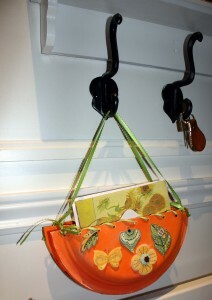 The elder made me a lovely jewelery box and necklace, and the younger, what appears to be a hanging mail holder. These are by far the best gifts a mom could ever receive because there is no monetary value attached to these, just pure sentiment and that’s exactly what every mother covets from her children. The rest of the day was spent with family celebrating mothers and grandmothers and even one great grandmother. I even had an opportunity to share some one-on-one time with my Mom. I decided to take her to the nursery to pick out flowers for her planter, which I offered to buy and plant for her as a combined Mother’s Day and birthday gift (her birthday is a few short days away). While it may not sound like a glamorous outing, it was what I like to call “time well spent.” I consider my Mom to be my close friend, and any time spent together is a good time. I think it’s safe to say that mothers and daughters tend to have a special bond that’s different from the bond shared by mothers and sons. However I do hope that I remain close with my boys as they get older. The day concluded with a barbeque right at home. My contribution, other than the venue, was my 1-2-3-4 lemon cake, which was a big hit and looked spectacular (if I do say so myself). In some ways I wish every day was Mother’s Day, but if I really think about it, every day IS Mother’s Day. Not a day goes by that my boys don’t need the comfort or care of their mom, and while there are moments where it gets to be too muchÂ I think I’ll take it while I can get it. I already know how fleeting childhood is and while I will always be their mother, I imagine a day when my boys will no longer wish to cuddle in my arms or be tickled. But I do hope they will always seek me out for advice or simply be a shoulder to lean on. Happy Mother’s Day. Yes, Passover is over. But I couldn’t let it go by without mentioning my flourless chocolate cake. You see, my husband’s birthday falls in and around the time of this blessed holiday. This isn’t the end of the world if you’re an adult, but if you’re a kid, well then it is the end of the world because your cake choices are severely limited by the restrictions associated with Passover. No Angel Food Cake, no anything cake that requires baking powder, baking soda or flour. So your options are really limited to ice cream cake and cheesecake. But what kid is going to want cheesecake? And after a long, cold winter what kid is going to want to indulge in a mouth numbing brain freezing birthday cake? So I say to heck with it! Bake a really good chocolate cake, minus the flour. I came across this recipe quite by chance. It’s not in a Jewish cookbook so it isn’t even designed to address the dietary restrictions of Passover. It just happens to fit the bill. Come to think of it, it’s also a great cake to make for someone who can’t eat any gluten. I found the recipe in a book called “The Clueless Baker” penned by Evelyn Raab, who recently retired as food editor for Today’s Parent Magazine after twenty years. I own many a cookbook but I must say, of them all I really enjoy Evelyn’s wit and sense of humour in this book. I wouldn’t classify this recipe as “easy” or “beginner,” because there is some egg separating involved and that can be a little dicey for some people, not to mention the folding of the stiffened egg whites. So this recipe isn’t for the faint of heart. But once it’s been made, it can be enjoyed by all! It’s rich, not overly sweet and smooth much like a chocolate mousse. I’ve included a couple pictures, which really don’t do it justice. If you really want the full sensory experience, bake it. I think it’s fitting that during the one week of the year I am not allowed to partake in eating any food stuffs made with leavening agents (eg. 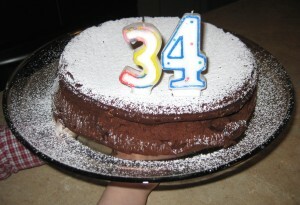 baking powder) I’m going to write about birthday cakes. Those who know me well know that I love to bake. I’ve always dreamed of selling cakes, pastries, cookies and breads at a bakery but I’m not sure that romantic vision would translate into cold hard cash. I don’t think I’d like to wake up at the crack of dawn to bake baguettes and chocolate chip cookies for customers only willing to pay me 2 bucks a loaf and 50 cents a cookie.Â I have yet to figure out the business model that would allow me to bake my treats at my leisure and at at the same time convince a paying customer that my cakes are worth $500 a pop. So until I turn that dream into a reality I like to bake for my family. In particular, since becoming a Mom, I started challenging myself to bake birthday cakes for my two boys that were kid-friendly to look at, but adult-friendly to taste. This year I baked my younger son a rich chocolate cake in a cake mould shaped like a race car. 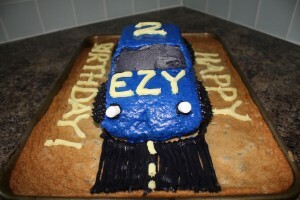 I “mounted” the #2 blue car on a sheet of chocolate chip cookie iced to look like asphalt. The cake recipe came from the original Barefoot Contessa cookbookÂ and the cookie recipe, which I doubled, came from Ina Garten’s Barefoot Contessa Parties! My older son, who turned 5, had far more specific stipulations about what kind of cake he wanted and how exactly it should look. He vascillated between a vanilla “Buzz Lightyear” cake and a lemon “Batman” cake but I reminded him he had the Buzz Lightyear cake for his 4th birthday, so he settled on the latter. So a lemon cake it was (a sophisticated palate for a 5-year-old, no? ).Â The cake recipe came from Martha Stewart and it’s called a “1-2-3-4 lemon cake.” There’s a lovely lemon curd that I made to go between the layers and the icing is just a simple butter cream. 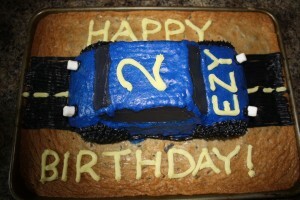 Take a look at the cake I made for the little guy this year. Passover begins tonight. And that means eating lots of eggs, meat, vegetables (that don’t fall into the legume category) and of course, matzah. For the uninitiated matzah is supposed to be the modern-day version of unleavened bread. During biblical times the Jews, in their haste to leave Egypt after 400 years of slavery, did notÂ Â have the time to letÂ their bread rise before baking it. They ended up with what look likeÂ over-sized crackers that are, in my opinion, devoid of any redeeming flavour. Today, these oversized crackers, made under the strictÂ supervision of a rabbi, come in a number of varieties. Plain, whole wheat, egg, spelt, even chocolate dipped.Â My husband and I are partial to egg matzah which is made with “matzah flour,” sweet apple cider and eggs. Matzah is also “repurposed” into a flour, a “cake meal” or straight up “meal,” which I often use for matzah ball soup, in meatloaf, meatballs and hamburgers. I actually think it’s better than using bread crumbs because for a product that isn’t suppose to encourage leavening, matzah meal has the astonishing ability to add fluffiness and fullness to my meat dishes. As I write this entry I have a dozen matzah bagels baking in the oven. I, like my ancestors, was distracted by my two youngÂ “Pharaohs” and in a rush when I was making them, so the bagels look more like pancakes. I’ve made these before so I know something’s amiss. I followed the recipe in my cook book, Second Helpings, Please! This cook book was originally published in 1967 as a compilation of recipes by the Montreal-based Mt. Sinai Chapter of Jewish Women International of Canada. My grandmother first gave me this book when I moved in with my husband (then boyfriend). I misplaced the book in my many moves back and forth across the country. 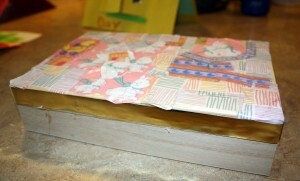 I was crestfallen by this loss because that book was very special to me. So when my mom gave me a new copy two years ago with an inscription on the inside of the cover with a sentimental note, I was very touched. My first attempt at the matzah bagels aren’t worthy enough for a picture, but thankfully I have eight WHOLE days to try this recipe again and get it right. And when I do, OH! when I do….I will be sure and put a picture of the tasty morsels up on the site along with the recipe. Unlike me, you will no doubt have the time to let the bagels cook properly. Right now my modern-day Pharaohs are ordering me out of the house and into the car to take them to their grandmother’s Seder. So in that vein I will say see you in Jerusalem….Happy Passover!